Resident Evil creator Shinji Mikami’s new studio Tango Gameworks have just put out their debut title, the gruesome and terrifying The Evil Within. 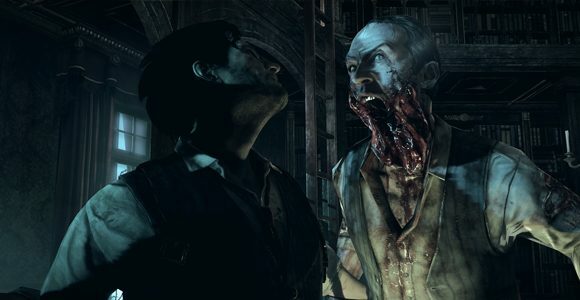 Released for the PC, PlayStation 3, PlayStation4, Xbox 360 and Xbox One, The Evil Within is a tale of both psychological and physical horror in which grizzled detective Sebastian Castellanos finds himself in a nightmarish, blood drenched world with horrifying monstrosities, with no certainty of what is real and what is taking place in his mind. Like another survival horror game released recently, Alien Isolation, The Evil Within presents a more balanced form of the genre in a time when survival horror games have see-sawed between two extremes: the weaponless, fleeing simulators like Outlast and Amnesia and gun-toting actioners like Dead Space and the most recent Resident Evil games. Instead, The Evil Within emphasizes stealth and subterfuge to evade its tougher, more resilient enemies, but provides you with some means of defending yourself, although ammunition and supplies are excruciatingly scarce. It was incredibly important to me and the team to bring the Survival Horror genre back to its roots. For us, it was all about creating fear and giving the player the enjoyment of conquering it. Up until now we’ve kept a lot of the game under wraps to avoid spoilers, so it’s very exciting that people are now able to experience the game from beginning to end. Reviews of the game have so far been kind, with the game maintaining an impressive 84 score for the Xbox One on Metacritic. The PC version has received plenty of anger over the developer’s decision to lock the framerate at 30 fps, as well as maintaining a letterboxed 2.35:1 aspect ratio that consumes nearly half the screen with black borders, although they have also put out instructions to use console commands to alleviate these problems. So far few problems have been reported from unlocking the game’s framerate, and Tango have promised to iron out bugs that have arisen from doing this, but a proper solution to removing the black borders currently does not exist, as using the console to alleviate this merely stretches the game screen to nearly unplayable levels. A season pass for The Evil Within is also available for purchase, which will include new content in which players take on the role of The Keeper, one of the game’s antagonists, and Juli Kidman, Castellanos’ female sidekick. It should be noted that this discounted offer “may not be available on all platforms or in all territories,” and publisher Bethesda has not been more specific than that.